Arbaaz Khan and Manjari Fadnnis were last seen together in Jeena Isi Ka Naam Hai, and the duo have now teamed up for Pradeep Rangwani and Subroto Paul’s directorial venture, Nirdosh. 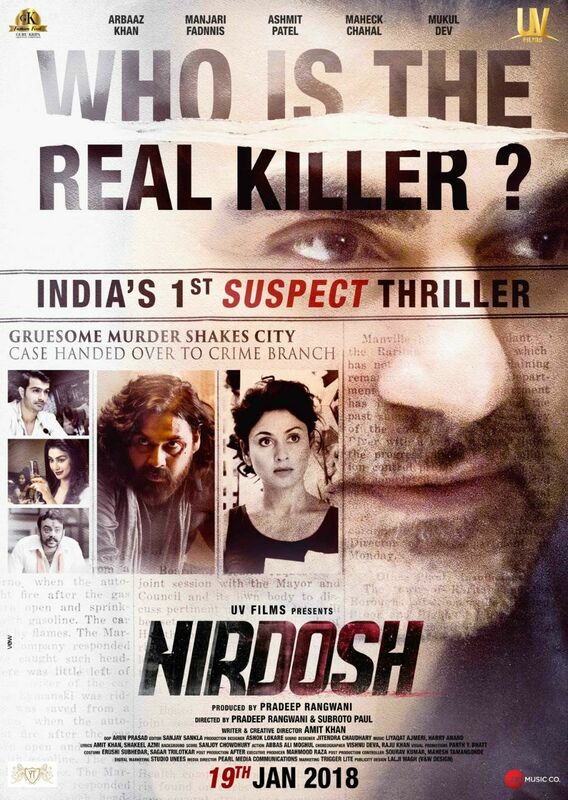 The film is being called India’s first suspect thriller, and also stars Ashmit Patel, Maheck Chahal and Mukul Dev. The latest trailer of the film dropped today, and it is quite impressive. Arbaaz Khan will be seen playing the role of a self-styled cop, and has some impactful dialogues in the film. Interestingly, while everyone is a suspect, both Ashmit and Manjari can be seen making a confession at the end of the trailer, which makes the plot even more interesting. Produced by UV films, the film is scheduled to release on 19th Jan 2018, and looks like a murder mystery to watch out for!